Week 39: Comic fest and thoughts of moving! The DeafArt and Kentmere groups have continued while our other groups have a break to move and prepare for the comic art festival window displays that need to be up by next Friday. A group of our service users visited the unit on Friday just to take a look and find out where to go. It is also difficult when you feel ill to make changes and our move is a very big change for people to deal with. The new place has a lot of potential and we can hopefully expand what we do to help more people. We were busy this week making all the bits that will make up our window displays in Game, Kendal for the Comic Art Festival Windows Trail. Its not easy to picture how it will all come together! In the session on the ward, we took our cue from the Pioneer Projects’ initiative, which involves decorating envelopes with artwork in order to send them out and pass the artwork on. The all-inclusive, no-boundaries nature of the idea m…eant that a range of creative expression took place; from the abstract, to the more intricately-decorated or pictorial forms of covering, there was a great deal of variety on show in the resulting collection. The DeafArt group has been carrying on during the break for our other groups. This week they were creating swirly and bubble pictures just experimenting with paint. As September gets underway we have a sense of mounting excitement in Space2Create as we move ever closer to moving into our new gallery and studio space. There will be a lot of work to do to get it ready. There is also increasing awareness that the Comic Art Festival window display needs to be in place by October 3rd. A very busy month ahead! It was great to post of the Mayflies the WellArt group made a few weeks ago and the artist, Katerina Prior, who is building the display at Rheged was very grateful for our contribution. Please keep a look out on our website and facebook pages for news about the move. Next week is the last normal week of sessions before we close ready to move. The 2Create group joined the WellArt group in making pieces for a group mixed media piece ready to go in the new Gallery. 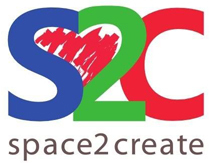 We want to create a large work made from smaller pieces by as many people involved with S2C as possible. We also taled about the Comic Art Festival window and made some plans. There were three different things going on in the session. One group were working to create pictures with a limited palette, say just reds or just blues. Some were working towards the Comic Art Festival by making Space Invaders for the Game… window display. Some people did more mixed media pieces for our group art work to go in our new gallery space in October. As always the WellArt group were very focused and creative but also supportive and helpful. In today’s session on the ward, we were experimenting with curved lines. One technique we used was to draw lots of dots on some paper, and then attempt to connect them up using only curvy lines; others just drew the curves freehand without …guidance. Some then embellished these curves by superimposing yet more layers in different coloured pen; others filled in the various gaps using a variety of colours. One participant even created using curves and mixed media. This made for a relaxed, freely experimental and chatty session, in which some remarkable results were achieved. This week the group was extremely busy and it was lovely to welcome two new participants. There were many unique and individual items being created. Due to the large and varied skills of participants it is always a very supportive session with group members sharing ideas and planning future sessions as well as practically helping each other when necessary. The DeafArt group were doing the classic half page prints this week. Painting an image on one side and then folding in half to print a copy on the second.